1. Cut the meat into small or large, but somewhat uniform, cubes. 2. Heat the oil and butter in a heavy-bottomed casserole. 3. Brown the garlic and remove. Take care not to burn. 5. Add the meat to the oil and onions and brown evenly. 6. Add the bouquet garni and cinnamon. 7. Add the wine and cook a few minutes to reduce slightly. 10. Bring to boiling point, reduce heat and simmer 2 hours. Check occasionally to ensure there's sufficient liquid. 11. Remove the bouqet garni and adjust the seasonings. 112. Just before serving, add the cream and reheat. Serve in bowls accompanied with Italian bread. Polenta is a suggested accompaniment. This stew can be adjusted to your taste and available ingredients. Use a half-pound of ripe tomatoes, peeled, seeded and chopped. The liquid can be all wine (red if you prefer) or more broth. Use other vegetables, such as potatoes, artichokes, peas, carrots or mushrooms, adding them the last 30 minutes of cooking. Butter, cream and restrained use of garlic (note the garlic is removed after flavoring the oil) are typical of Piemontese cuisine. 1. Prepare the mushrooms by cleaning as gently as possible. Don't wash unless it's really necessary, as they are so tender. Be sure to use a soft brush or cloth. 2. Heat the oil in a saucepan and quickly sauté mushrooms with the garlic, thyme, 1/4 cup of the parsley and the lemon juice. Add salt and pepper to taste. Set aside. 4. Melt half the butter in a heavy-based saucepan. Add the onion and sauté until soft. 5. Add the rice and sauté, stirring constantly, until the rice absorbs the butter and begins to look transparent. 6. Add the wine and boil until it is almost evaporated. 7. Add 2 ladles of warm stock and keep stirring. 8. Add the sautéed mushrooms and keep stirring. Reduce heat. 9. As the rice dries. Keep adding ladles of stock in small amounts until the rice is at your favorite consistency. 10. Add 1/2 cup of the grated cheese and stir in. Adjust the seasoning. 11. Serve in shallow bowls and garnish with reserved parsley. Additional grated Parmigiano-Reggiano may be served to accompany the risotto. Once you feel confident making risotto, variations are limited only by your creativity. 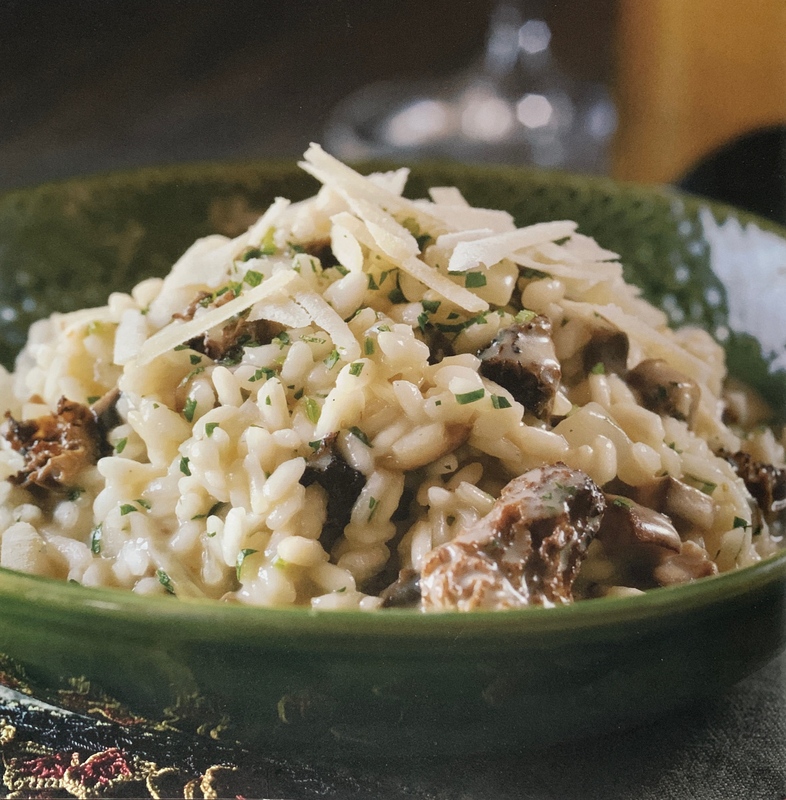 Red wine risotto is also a classic dish more commonly served with game birds. 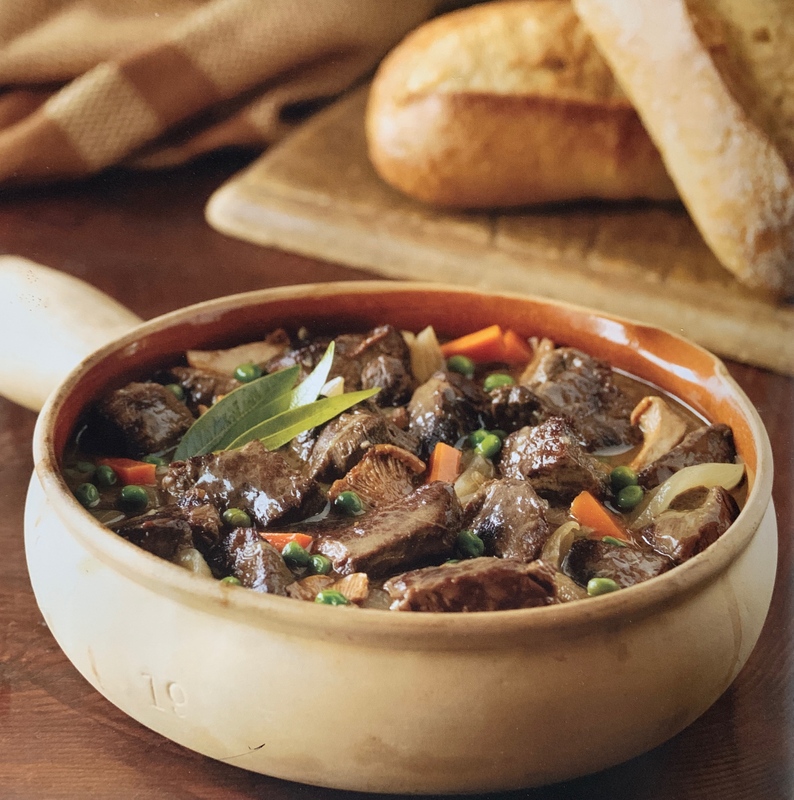 With red wine, use vegetable, veal or beef stock instead of chicken. 2. Rinse the chicken in cold water and lay it on a clean cloth to dry. 3. In a well-soaked clay pot, layer the chicken breasts, sprinkling each layer with salt, pepper and tarragon. Pour wine over the chicken. 4. Place the top on the clay pot, and put it in the center of a cold oven. 5. Turn the heat to 480°F and bake for 70 minutes. 6 Carefully remove the very hot pot from the oven. 7. Arrange the chicken in a warm serving bowl. 8. Make sauce by straining the liquid from the clay pot into a saucepan. Heat just to boil, reduce heat, and stir in arrowroot to thicken. Adjust seasonings. 9. Arrange the chicken with whole sprigs of tarragon (if you’re fortunate to have a plant outside the kitchen), or garnish with some of the sauce and a sprinkle of tarragon. Surround the chicken with roasted or boiled colorful vegetables, or broiled tomatoes and grains such as farro, wild rice, or rice pilaf. Serve additional sauce at the table. 2. Add the bacon fat to a large casserole pan and place over medium-heat on the stovetop. 3. When the fat is hot, add the onions and garlic, sautéing briefly until translucent. 4. Add the sauerkraut, Riesling, chicken stock, bay leaves, thyme, juniper berries, and pepper. Stir and bring to a boil. 5. Remove the mixture to a bowl and set aside. 6. Arrange the ham hocks, bacon, and smoked ham in the bottom of the casserole and top with the sauerkraut mixture, spreading evenly. Cover with foil and bake for 1 hour. 7. Remove from the oven, top with the sausages, cover, and bake again until sausages are done, approximately 30 minutes. 8. Serve with an assortment of mustards.